This project visualises the 1165 journeys women made to seek refuge in London between 1st April 2015 and 31st March 2016. 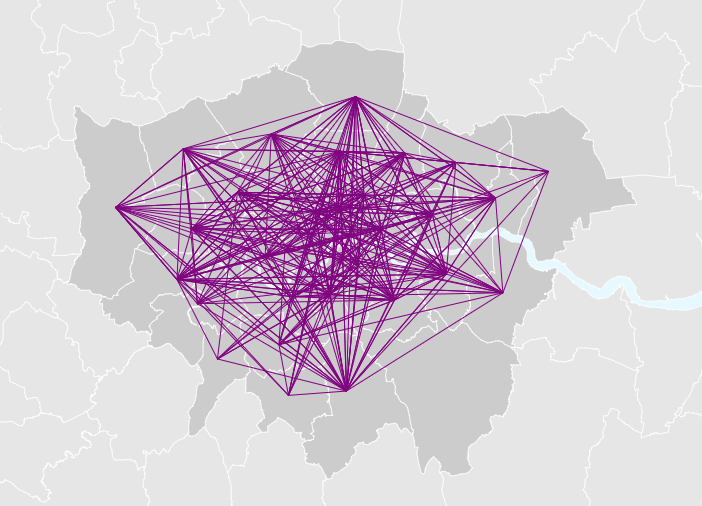 It has been designed to illustrate how far and wide women migrate across London boroughs when seeking safety from an abusive partner. This site is intended for professionals and others who have an interest in the provision of refuge services in London. It has been created by Nissa Ramsay, as part of a Masters in Digital Sociology at Goldsmiths University, in collaboration with Women's Aid to help inform how services are provided for women seeking refuge in future. To find out more about the project click here or scroll down to learn more about women's journeys. Read more about how this data was collected and how it is displayed on the map. 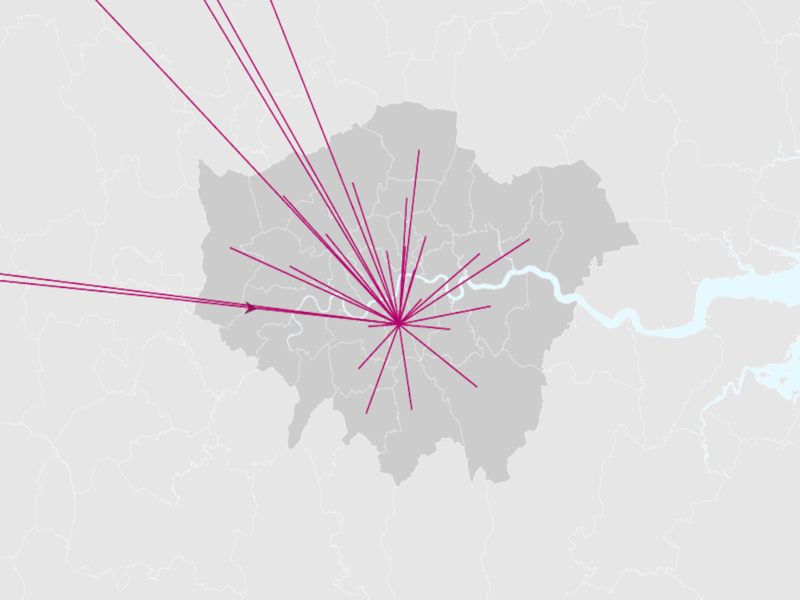 Why do so few women access a refuge in their own borough? 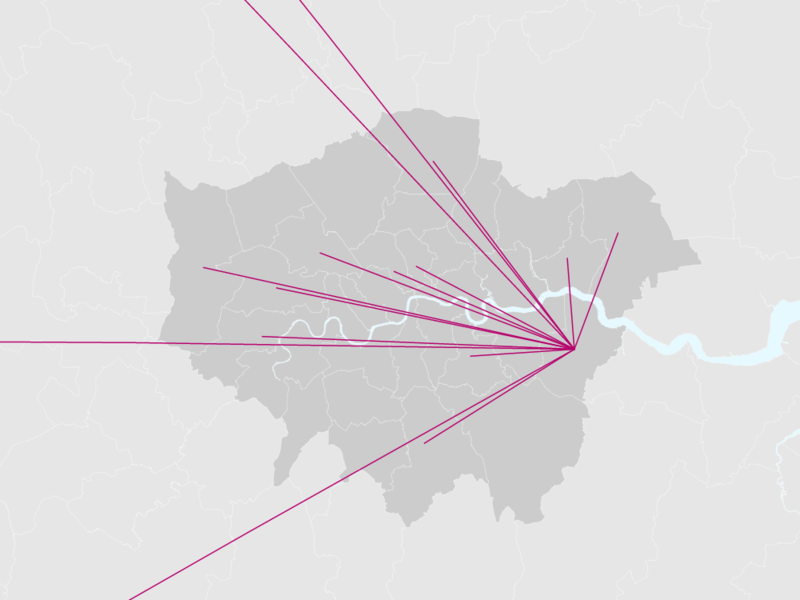 Why do women move to so many different boroughs? Why are the numbers of women arriving in each borough higher than the number of women leaving? Do lower numbers of women accessing refuge mean that there is lower demand for them? Are there enough refuge spaces to meet demand? Women (and their children) are moving out of every London borough to seek refuge in every other London borough. Of the 746 women from London who were placed in a refuge in London in 2015-16, only 51 stayed in their home borough (note that a further 77 women were from London but did not specify exactly where). This remains true for boroughs with the best refuge provision. For instance, Lambeth, Hackney and Lewisham have more refuge spaces than other boroughs. Lambeth and Hackney also had the highest numbers of women accessing a refuge (closely followed by Lewisham). However, very few women stayed in those boroughs. 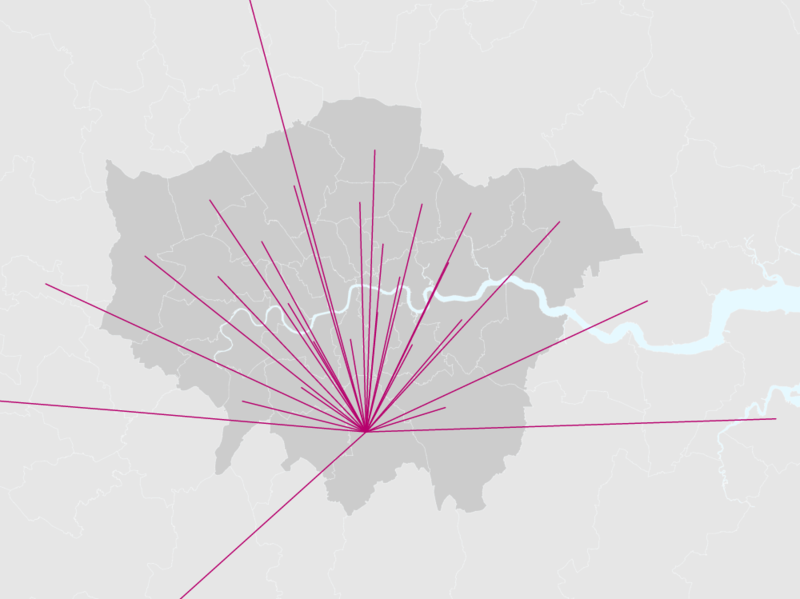 Overall, 93% of women moving within London to access a refuge move to a different borough. It is vital that women are able to seek refuge in their locality when it is safe for them to do so, or to move in to another borough if not. 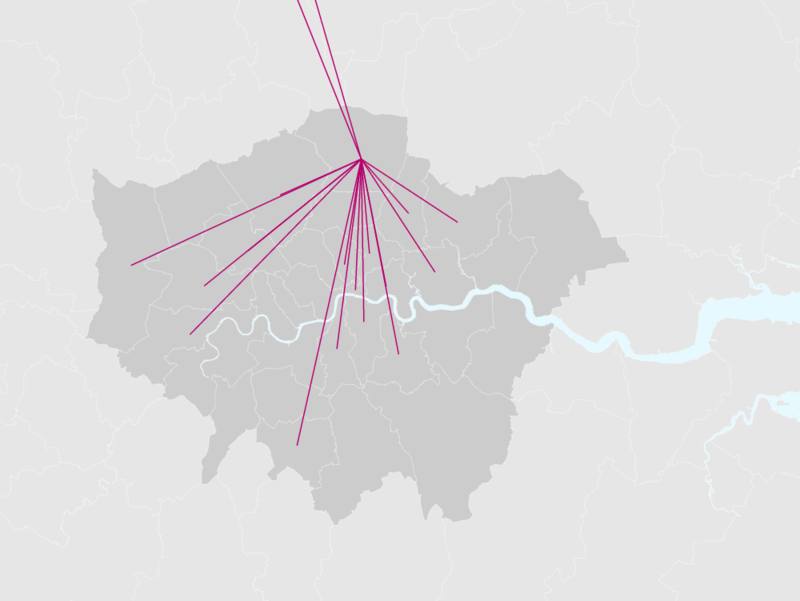 On average in 2015-16, there were journeys from each borough to 12 other London boroughs. Figure 1 shows their diversity, highlighting reciprocal migration patterns between many boroughs. Westminster, Hackney, Haringey, Croydon and Lambeth have the most diverse journeys arriving to access a refuge, with women travelling from over 20 boroughs in London to access a refuge. Women also leave those boroughs to more than 15 other London boroughs. Barking and Dagenham, Enfield and Croydon, have the most diverse journeys leaving to seek refuge, with women moving to over 19 other boroughs (closely followed by Hillingdon, Brent, Newham, Ealing, Lewisham and Haringey with women leaving to 18 other boroughs). Services need to be provided and funded to allow for diverse migration patterns between boroughs, near and far. Between April 2015 and March 2016, 248 women travelled to London from across the UK to access a refuge. It is important to note that there are also no distinct patterns as to where in the UK they travel, with some coming from the North of England and from as far as Edinburgh. The map above has not illustrated these journeys due to their complexity. Instead, the images in Figure 2 demonstrate the breadth of these journeys from the UK, with very few women from immediate neighbouring boroughs. This remains true for both outer London boroughs and those boroughs with the most women travelling from outside London to access a refuge space. These findings reflect wider academic studies of domestic abuse migration journeys in London and across the UK. For example, Bowstead 2015 found that for 10,000 migration journeys to seek refuge in England in 2008-9, over 80% were travelled by only one or two women in a year. Similarly for London, the 746 women who identified the borough they lived in prior to accessing a refuge made a total of 419 different journeys. Of these journeys, over 70% were made by only one or two women a year. It is important to recognise that any changes to the provision and funding of services in London will have national implications. In total, there were 5399 calls to the National Domestic Violence helpline with a recorded location in London (this represents approximately 95% of calls answered by the helpline). The highest numbers of calls to the National Domestic Violence Helpline were recorded from Lambeth, Croydon, Newham, Lewisham and Hackney. However, given the lack of data for those women accessing refuge space outside of London, it is not possible to conclude whether this corresponds the number of women who subsequently accessed a refuge. Whilst these figures only give an indication of demand for help, information and refuge services, they do highlight that the National Domestic Violence Helpline receives many more requests for refuge spaces than there are spaces available*. The provision of refuge spaces in London also falls slightly below the Minimum Standards for Refuge Provision, set by the Council of Europe, which specifies that 1 family should be available for every 10,0000 population. In London, there were 812 refuge spaces available in May 2016, compared to 854 spaces required to meet the minimum standard. In the UK, there is also an overall 30% shortfall in the spaces required. This is likely to be increasing demand for London refuges and may account for some of the women travelling from outside of London to seek refuge. The Women's Aid annual survey also found that in 2013/14 nearly a third (31%) of referrals to a refuge were subsequently turned away because of a lack of space (data provided by 115 services, noting that women may approach multiple refuges). Further analysis is crucial to determine where additional refuge spaces are most needed. *The exact numbers were not available at the time of writing this report but requests for spaces have been recorded and analysed by Women’s Aid to draw this conclusion. A refuge is a house where women and children who have experienced domestic violence can live in safety, with support from specialist-trained staff. There is no one type of refuge. Some have self-contained flats, whilst others provide private rooms for a woman with her children with other shared communal areas (living room, kitchen, bathrooms). See the Refuge Website to find out more. Women can be placed in a refuge by calling the National Domestic Violence Helpline, which is ran in partnership by Women’s Aid and Refuge. It is important to note that this project has not included data for the numbers of women leaving London to access a refuge space. However, some women will of course leave London to access refuge elsewhere in the UK. This is evidenced by Bowstead 2015 whose analysis of 10,000 refuge journeys concluded that there was an overall net migration of women leaving London. The primary concern when placing a woman in a refuge is the need to keep them safe, which may not be possible if they live in the same local area as the perpetrator. Those women who are placed in their own borough may also later need to move on to another refuge to ensure their safety. Each woman's circumstances and subsequent journey (and the reasons for making this) are unique and there are many reasons why women may need or want to leave or stay in their own borough to access a refuge space. Factors may include refuge availability at the time of fleeing an abusive partner (refuge spaces cannot be booked in advance and are often oversubscribed), the need for specialist services and their availability (such as mental health support) and personal requirements (such as rooms to accommodate children, connections to friends and family) or the likelihood of being able to find new accommodation. The primary concern when placing a woman in a refuge is the need to keep them safe, which may not be possible if they live in the same local area as the perpetrator. The borough a woman moves to in order to access a refuge could depend on choice or necessity or both. Contributing factors are likely to include refuge availability at the time of fleeing an abusive partner (refuge spaces cannot be booked in advance and are often oversubscribed), the need for specialist services and their availability (such as mental health support), personal requirements (such as rooms to accommodate children), transport to work, connections to friends, family and work in the area, knowledge of an area or the chance to secure move on accommodation from that borough. Firstly, the number of refuge spaces available in each borough is different. Some boroughs also have more than one refuge, providing specialist and general refuge services. Secondly, this project has not included data for the numbers of women leaving London to access a refuge space. However, women do leave London to access refuge elsewhere in the UK. This is evidenced by Bowstead 2015 whose analysis of 10,000 refuge journeys concluded that there was an overall net migration of women leaving London. For those boroughs with lower numbers of women accessing spaces, compared to the spaces available, it does not follow that there is less demand for vacancies. The data mapped only includes new women placed in a borough in April 2015 – March 2016. It is likely that women were already staying in these prior to April 2015. Furthermore, the average length of stay in a refuge varies considerably. Typically, those women who stay longer in refuge accommodation do so due to difficulties finding suitable housing to move onto. The demand for refuge spaces is higher than the availability of refuge spaces. The National Domestic Violence Helpline receives many more requests for spaces than the spaces available. The Women's Aid 2014 Annual Survey reported that nearly a third (31%) of referrals to refuges were turned away because of a lack of space (data provided by 115 services across the UK). The numbers of refuge spaces in London almost meet the Council or Europe minimum standards, which specifies that 1 family space should be available for every 10,0000 population. In London, there were 812 refuge spaces available in May 2016, compared to 854 minimum spaces required (ONS 2014 Population data). More spaces are required in London, particularly given the numbers arriving to seek refuge from across the UK.